I just returned from a short vacation making the most of the last days of summer (Downunder) to find the Cambridge family also enjoyed a little time off last week. Our climates were polar opposites. While I was taking in the sun and the surf, the Cambridges headed to the ski fields in the French Alps. The Duke and Duchess of Cambridge are delighted to share new photographs of their family, enjoying a short skiing holiday with their children in the French Alps. The Duke and Duchess invited the Press Association’s Royal Photographer John Stillwell to take the photographs earlier in the week. This was their first holiday as a family of four and the first time either of the children had played in the snow. It was very special and fun short holiday for the family, and they are grateful that John Stillwell was able to capture the moment so well. John Stillwell is the same photographer who took the pictures of Prince George at a Butterfly Exhibit in 2014 to mark his first birthday. The photos were taken at the Courchevel ski resort, in the Les Trois Vallées region. Duke and Duchess of Cambridge both looked happy and showed their playful side. One is never to old for a snow ball fight! 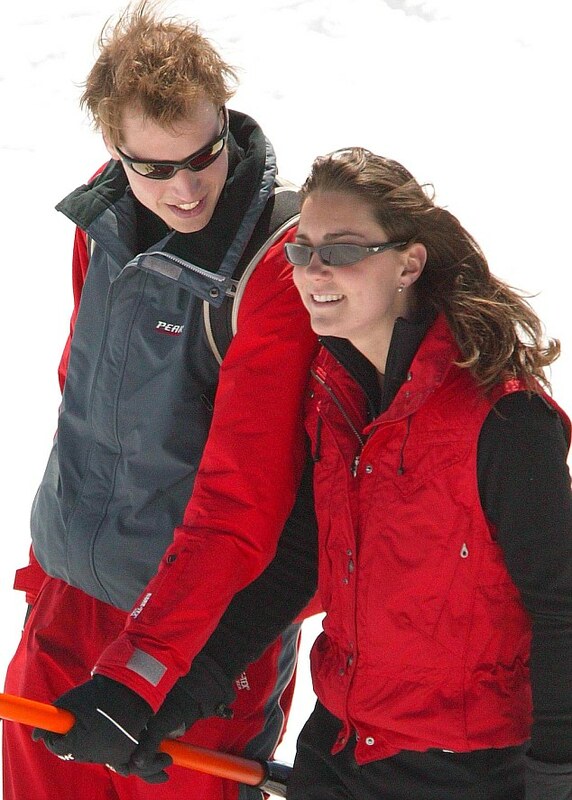 It's well documented that William and Kate are both avid skiers. In fact, their budding relationship was publicly revealed in March 2004 while their were pictured skiing in Klosters, Switzerland together. Kate continued to join William on the ski fields each winter after that. The photo above was taken in 2008 at the Klosters ski resort, and Kate wears the same white ski jacket on that holiday we see her wearing in the new photos. The jacket is by E+O, a British brand founded in 2007. Kate's ski pants are also by E+O and they date back to at least 2008 as well. Kate’s hat is by Eisbar, a niche Austrian ski hat company. Kate wears the brand’s navy Alwin pompom polar beanie, made from a 50/50 blend of wool and acrylic. It features a polar bear and snowflake print and a fleece lining for extra warmth. The What Kate Wore community did a fabulous job in identifying the remaining pieces worn by Kate in the photo shoot. Kate’s goggles are the UVEX 'Ultrasonic' Pro Ski. She kept her hands warm and toasty in a pair of Restelli for Alexski women's mittens (£295). The mits are designed by Italian glove maker Restelli Guanti exclusively for Alexski. They are made from black English kid leather and lined with a waterproof membrane and a full interlining of possum fur. On her feet she wore the Sorel 1964 Pac 2 snow boots in Buff with contrasting natural faux fur. They are still available on the Sorel UK site (£110), and a variety of retailers including My Theresa (€130) and Amazon (US$124.99). She completed the look with her KIKI 'Grace' White Topaz and Diamond Stud Earrings. Head over to Princess Charlotte Style to get all the details on what the little prince & princess wore for their first trip to the snow.